Styled with '90s bergman tank . I got these leggings for a gift this past Christmas and was very excited as I thought being TNA, they would be great quality. My friends recommended them as well. They are very thin and the pair I have already got holes in them. I'm very disappointed and would not recommend them due to their poor quality. I have another pair from another store I purchased over 2 years ago and they are still in good condition with no holes or rips. Aritzia's leggings are the best. It's the only place I shop for leggings and the Equator legging is affordable. Love them so much, great fit!! Love everything about these pants! They fit snug in a good way and don’t get stretched out like normal leggings do. Colors are great. My favorite pants by far and I like them so much I bought 6 pair in all colors! Great leggings, comfortable, soft, affordable and resistant. Honestly it’s hard for me to find a nice legging. But this just perfect for me!! So comfy and they look great too! These are the best leggings...I always ONLY buy this brand! Love these leggings! 10/10 recommended! love these leggings!!! Always worth the money. The black ones are however a little see-through depending on the lighting. But great quality and fit and always look new after being washed. I've been wearing these leggings for years and they are always amazing, True to size, not too thick but not see through either. I have longer legs and the length is perfect still, definitely recommend these. Slightly see though. But most black leggings are now a days. But the material is very nice on the skin. Love these leggings. They fit well. Looks good. Soft and snug well making my legs slim. Soft, comfortable, flattering, though I find they wear down with regular use. I have ordered over a dozen of them over the past few years. I liked these so much that I ordered another pair. They're very comfortable & I like the idea of being able to cut them to length. The only reason I gave it 4 stars instead of 5 is because I wish they had another seam tack half way between the bottom one & the next one up. I'm short but I guess not that short! I have bought a few pairs and mine always rip after around two months of buying them, super comfortable though. I love the fabric its super soft just not very durable. My daughter loves these pants. The material is soft and washes well. The length is a little short. My daughter is shorter so the length is perfect for her. Sizing is slightly smaller. She normally wears a medium and we bought the medium. They just fit. She could have sized up and they would still be ok. These are the world's best leggings. I have come back for more and more over the years and have never found any that top these. The best leggings I’ve ever owned! These leggings are the absolute, most comfortable leggings I’ve ever purchased. I’ve been wearing them since I was in my early 20s and now I’m my 30s, still my go to. They fit all body types which I love. Fits true to size and super soft and comfy. I have 4 pairs and an obsessed! These are my fav leggings. You can wear them anywhere. They are lightweight and very comfortable. I always wear them to travel. Me, my 13 year old daughter and my 15 year old daughter ALL love these leggings - they are comfy and flattering (and we're all different shapes!) 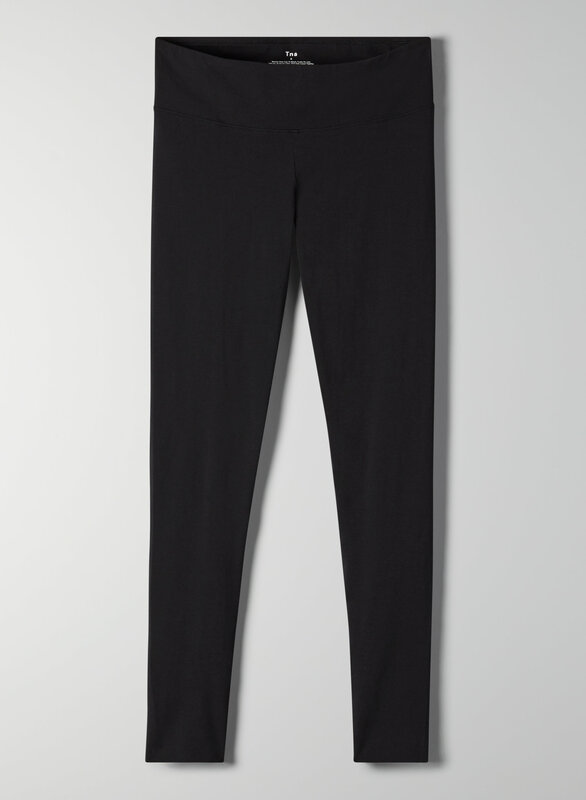 We've tried all the Aritzia leggings and these are our faves! You can see right through these. Not just a little, I mean the world can see my whole behind. They are comfy though, and I still wear them. But I definitely shouldn’t. I love the fit and waitband. They are super comfy but borderline see through. So soft and not tight! Considering they are tights!